Without question, dental implants in Friendswood are one of the best tooth replacement methods available today. They have the potential to provide a lifetime of healthy, strong, and beautiful smiles for individuals who have lost one or more teeth. However, the process for placing dental implants is delicate, and your dentist may have to perform some preliminary work on your mouth before it is ready to support your new smile. A bone graft is often an essential step in the journey to a restored set of teeth. Why Might a Bone Graft Be Necessary? One of the most amazing things about dental implants is that they form a bond with the bone around them, which allows them to provide the strongest base possible for your new teeth. For that bond to be successful, however, it is important that you have a strong jaw. If it has been some time since you lost your teeth, your bone may have deteriorated and become too soft, narrow, or short to provide your new smile with the support it needs. 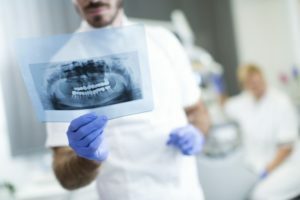 After taking some detailed images of your mouth and the surrounding structures, your dentist will talk to you about whether you need a bone graft, the type of graft you need, and how it will affect your timeline for receiving implants. During a bone graft procedure, your oral surgeon will place extra bone material on the part of your jaw that will receive the implants. The material they use may be bone from another part of your body, animal bone, or a special artificial material. Over time, your body will accept the new bone, and your jaw should be in good shape to receive your dental implants near League City. In some cases, a bone graft can be performed at the same time as the implant placement surgery. Most of the time, though, patients must wait a few months after the bone graft before they can receive their implants. A sinus lift fortifies the upper portion of your mouth, placing more bone between your sinuses and your palate. A lateral ridge graft makes the jawbone wider. A block bone graft corrects major defects in the jaw’s overall structure. If you need a bone graft before your implant surgery, there is no reason to fret. When you entrust your care to a true expert and follow their instructions after your procedure, you can reasonably expect a smooth journey to a new, implant-supported smile. Dr. James T. Sierra is a dentist who has a special interest in implants. In fact, he is a Fellow of the International Congress of Oral Implantologists and a Master of the International Dental Implant Association. If you are interested in regaining your lost smile and would like to speak to Dr. Sierra about your tooth replacement options, contact our office at 281-482-2631.